This article is Part 6 of a series. If you’re a regular reader, then you may wanna use the relevant jump links above to go directly to the actual review. But if you’re a new reader, then I insist that you read up on that part. By the way, if you need to check out the previous week’s performance, then go ahead and click on the link below. If you’re a first-time reader who stumbled across this write-up for some unknown reason, and you have no idea what this is all about, then just know that I crafted a purely mechanical trading system, pursuant to My 2018 Trading Resolution. If that piques your interest and if you may wanna know more, then click on the links below to read up on the rules of the system. With that out of the way, it’s time to finally discuss how the week went. 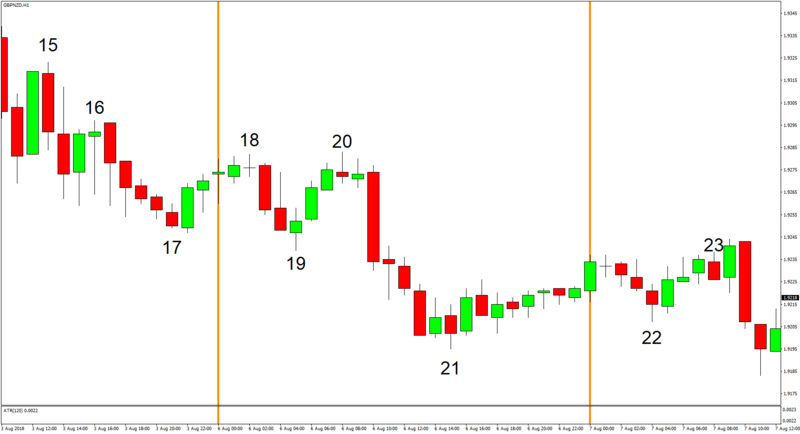 Below you’ll find charts of each trading day of the week. 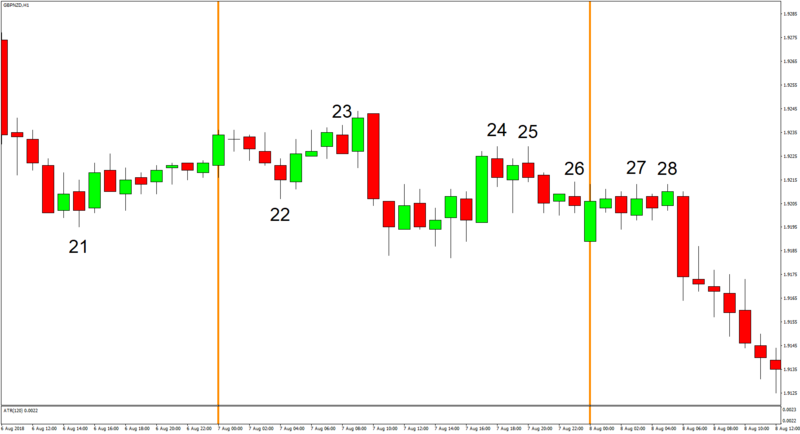 And if you’re wondering what the numbers on the charts are about, they refer to the trade #, based on the chronological order when the signal was generated, not necessarily when the trade was opened or closed. 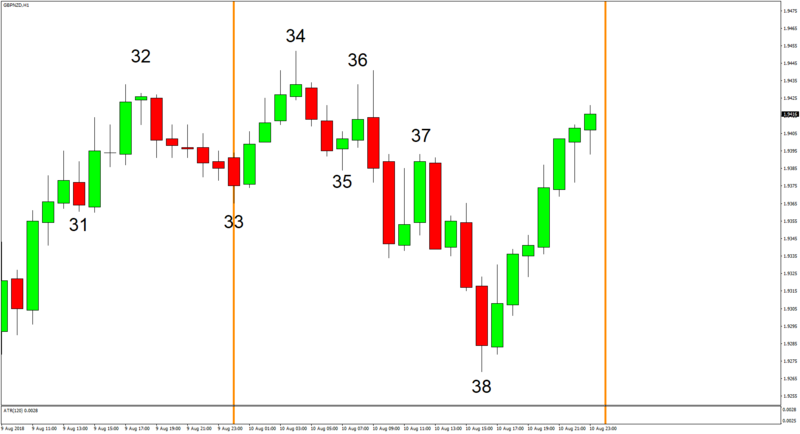 And the details of each trade are contained in the table after the charts. Just scroll down. 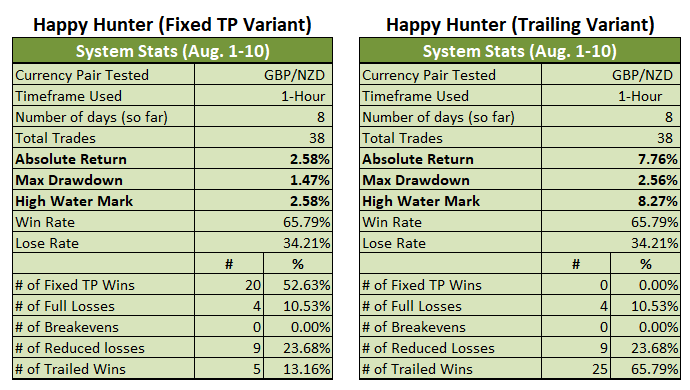 Both Variants of the (very) Happy Hunter Trading System did pretty well this past week. The Trailing Variant, in particular, did splendidly well since it raked in an impressive 8.70% in gains this past week. The Fixed TP Variant, meanwhile, was able to harvest 1.92% in gains, which is still a very solid performance. 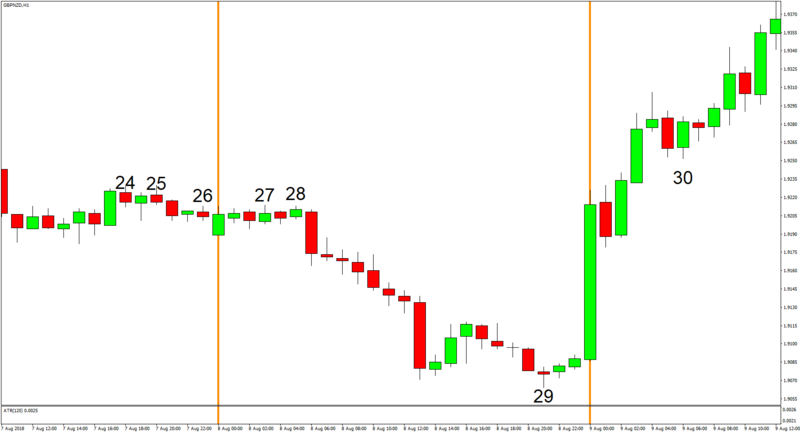 And the reason why both Variants did well this past week is that volatility finally picked up since the average daily range this past week was 169 pips, which is much more than the previous week’s average daily range of 106 pips (but still below the 225-pip historical average). Both Variants actually had a rough start, though, since price action didn’t really start to pick up until Wednesday before exploding on Thursday and then winding down a bit on Friday. Incidentally, both Variants were able to harvest the bulk of their gains on Wednesday and Thursday. 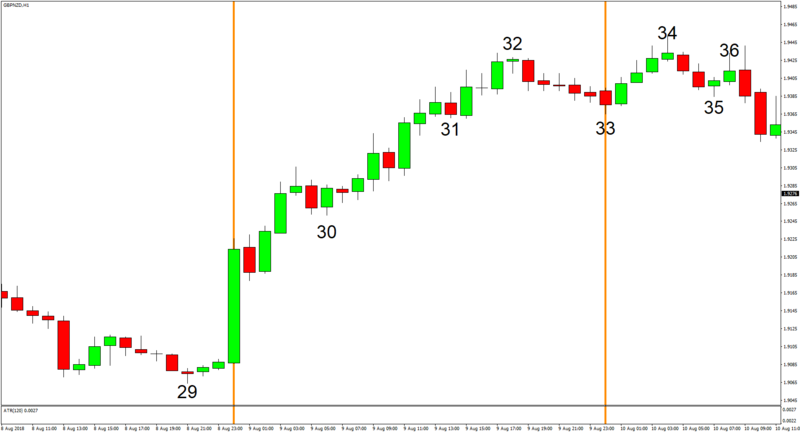 And the reason why the Trailing Variant’s outperformed the Fixed TP Variant so substantially is that the Trailing Variant was able to ride almost all of the 350-pip uptrend on Thursday via trade # 29. In fact, that one trade alone yielded 3.32% in gains, which is equivalent to around 10 full TP wins for the Trailing Variant. Anyhow, this past week’s very good run means that both Variants are now in the green for the month. I just hope we don’t get a repeat of July’s performance, wherein both Variants happily raked in gains during the first half of the month before crashing hard during the later half. Okay, that’s all I’ve got for today! And as always, I enjoy your feedback. So if you have any questions, or if you see a possible error in my work somewhere, or if you just want to say “hi” then don’t be shy and write a comment down below!